Let’s face it, this world is not the one we grew up in — and although we don’t like to think about it — evil does exist and surviving an attack begins with being prepared to be our own first responder. But selecting a defense firearm and essential gear for safe, legal, and effective concealed carry can be overwhelming and intimidating — to say the least. With the needs of both men and women in mind, this course is designed to help you get the answers you need so you are prepared to PREVAIL if ever forced to defend yourself in an attack against your home and family. During this seminar you will learn. . .
Let us help you gain the competence and confidence to move forward in joining the millions of Americans who understand that it is the responsibility of the individual citizen to protect themselves and their loved ones. 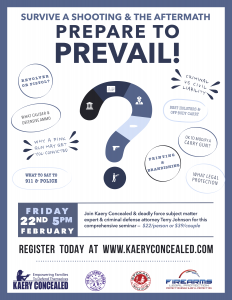 Join Kaery Concealed as we team up with criminal defense attorney and defensive use of force subject matter expert, Terry Johnson of Firearm Legal Protection. Through out the seminar, Mr. Johnson will answer your questions regarding the legal implications of protecting yourself and your family. It’s not enough to just survive the fight of your life — in order to truly prevail, you must survive the fight for the rest of your life. Terry L. Johnson is a successful criminal defense attorney who specializes in use of force in self-defense and firearms law. 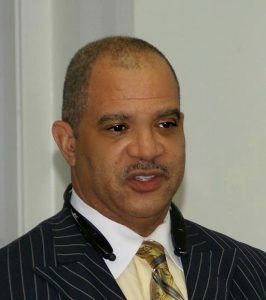 Terry went to Law School at Western Michigan University Thomas M. Cooley School of Law where he earned his Juris Doctorate. Winning the school mock trail tournament, and was runner up in moot court competition. Shortly after earning his Juris Doctorate, Terry opened his own legal practice and has successfully defended hundreds of clients. Terry is a legal subject matter expert on firearms and self-defense having appeared on all major media outlets in the Detroit area, and on several national news networks. In addition to his work in the legal arena, Terry also holds firearm instructor certifications from the National Rifle Association and the United States Concealed Carry Association. It’s also important to Terry to be involved in the community. He current is elected to his local school board and teaches at two reserve police officer academies. Currently Terry is Vice-President of Legal Operations for Firearms Legal Protection and holds a Bachelor of Science from Michigan State University. Kaery is a full time firearms and self-defense instructor who resides in the Pacific Northwest. 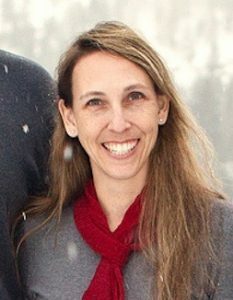 In 2003, she earned a Master of Education (with an emphasis in Curriculum Development for the Gifted) from Whitworth University and has been teaching for more than 25 years. Kaery is an evidence-based trainer and provides practical, street-proven defensive products and training to educate, equip, and empower families to protect themselves and those they love. She has trained under some of the most respected instructors and thought leaders in the protection industry to guide everyday students like yourself through the complex legal, moral, and social issues concerning the use of force in self-defense. She is certified by various national and international self-defense training programs (Rangemaster, National Rifle Association, SABRE Protection, The Well Armed Woman, WA Department of Fish and Wildlife, Utah Bureau of Criminal Identification, and Law of Self Defense). 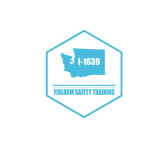 Kaery Concealed offers corporate, group, and private courses for civilians every day of the week all over the Pacific Northwest. Kaery and her husband, Eric, have been married for 25 years and are the proud (and often exhausted!) parents of 7 children ages 19, 17, 12, 12, 8, 7, and 6. As a family they enjoy water sports, camping, making music, reading, shooting sports, and ATVing all over the Pacific Northwest. Founded in 1916, Spokane Rifle Club offers the best and most varied facilities for shooting sports in the Spokane area. SRC is a member only club and is open 7 days a week, 365 days a year from 8am to dusk. The facility has an Indoor Pistol Range, Trap Range, Outdoor Pistol Range, and 100 and 200 yard outdoor rifle ranges.